A few months ago I was invited to speak at one of my alma maters – Millersville University in Pennsylvania. I hadn’t been back in almost forty years. I’d gone to college in Millersville after a long hiatus from education. In other words, I was a dropout. In the interstice I was a musician, a land surveyor, a straight man in a comedy duo and an advertising copywriter. Somehow I ended up living on farm in Lancaster County Pennsylvania. It was a beautiful old Pennsylvania Dutch farmhouse built around 1850 and sat on about 40 acres that were leased out to a farmer and a few more of unfettered woods and unplowed field. I’d gone there with the idea of writing a book. The problem was I hadn’t a clue how to do it. My reading up till that time had been helter-skelter and sparse, to say the least, and one day I woke up an realized I was … well… ignorant. A friend had a solution: go back to school. And it just so happened there was a little state college just up the road – in those days it was called Millersville State College, it had a more or less open admissions policy, and it didn’t take long before I was back in class. Only this time, at age 27, I was the oldest student around. Perhaps that’s really what saved me. I was more mature, more sure of what I wanted, which was knowledge. Every kind of knowledge. I was a ravenous learner – English, the sciences, history, and my favorite, philosophy. I expected to learn about Kant and Hegel and Rousseau and Plato. But what I actually learned about was pie. Apple, blueberry, cherry, peach, rhubarb, and, the ultimate, black raspberry pie. This was due to taking a course called “Oriental Philosophy” by a professor named John Ellsworth Winter. 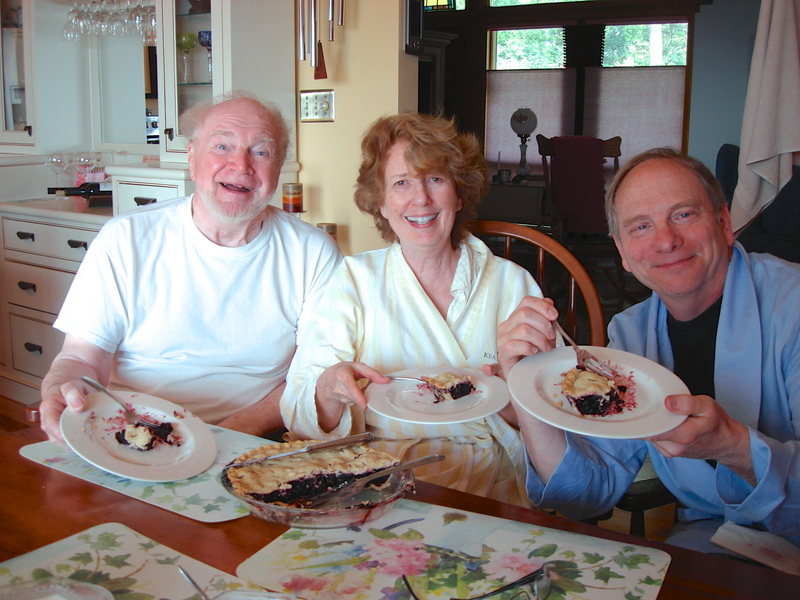 Ostensibly we were reading the Tao Te Ching, the Upanishads and a variety of Zen texts, but really what Dr. Winter was interested in was how to best enjoy pie. Pie represented to him the perfect confluence of attributes, as close to a Platonic form as is possible in this world of illusion, a kind of mystery in which the whole far exceeds the sum of its parts, and which, after having given its consumer a foretaste of paradise, leaves one in a state of Kantian awe – a kind of stupor in which words have lost their ability to elucidate and the mind cannot condense what it apprehends into a category of thought. To take a bite of pie is to experience the Tao in its ineluctable completeness: The Way That Can Be Wayed is Not the Way. The crust itself is a miracle of admixture – some butter, some flour, a pinch of salt and few tablespoons of water – how could these base ingredients yield such a divine flakiness, such a rich interior, such a mouth-defying sense of comfort? And the filling? A whole world of possibility opens up to you – a myriad of flavors from plum to chocolate to banana to strawberry and combinations thereof. And each filling demands a choice, a commitment – to choose one is to reject all others. But unlike marriage, pie is a fully open relationship. Today it is blueberry. Tomorrow it is coconut cream. And thus the full bounty of the natural world presents itself to you, the full bounty of a world imbued with grace – yours is only to employ the labors of your hands and the heat of your oven. Every sense is delighted – how beautiful it looks, and how each pie is as unique as a snowflake yet partakes of the essence of pie-dom – pie is the particular and the abstract, the actual and the ideal. And the aroma – is there anything in this world more seductive, more enticing, more imbued with motherhood, childhood, well-being and pure indulgence than the scent of a freshly baked pie just from the oven? And then the taste, the feel in your mouth, even the crumbs on your plate which you mush between the tines of your fork, render the most physical of needs – the need to feed – into a kind of encompassing bliss, an ecstatic connectedness to the very source of your being, the fullest appreciation of what it means to be human. All these things Professor Winter taught us. Pie is good, he said, but nothing, nothing in this universe can compare to pie in the morning. Pie for breakfast! To break all bounds of convention! To awake each day to the full possibility of life! The embrace the All even before you’ve brushed your teeth! We all believed him. We all thought: Ah, pie in the morning. But never once did he bring in a pie to class. Never once did he invite any of us to his house for morning pie. Yet this is what we yearned for. This was our holy grail. Dr. Winter had become my mentor and my finest teacher – even after years at the University of Chicago studying under some of the best minds in America, I continued to regard him as my greatest teacher, just as he regarded me as one of his best students. But of course the years passed. We fell out of touch. He continued on his pie-sotted journey through life, and I, far more pie-less on mine. But then the call came. To return to Millersville to give a keynote. I’d been back in touch with John Winter and he, now emeritus, agreed to join me on a panel a couple of days after the speech. In the meantime, he invited Gayle and me to stay with him and his wife Elva at their home. I knew this was my chance. Possibly my only chance. I might be the one student in all of recorded history to share pie for breakfast with John Ellsworth Winter. Finally the moment came. We were sitting in his kitchen after dinner, indeed talking late into the evening of things philosophical and political. “But did you ever invite anyone over to have pie for breakfast with you?” I asked. “Not that I recall,” she said. Though I had noticed that when we went out to a restaurant for lunch that day John ordered pie as an appetizer. Then he ordered pie for dessert. “I was just wondering,” I said. In an hour or so, we all said our goodnights, and Gayle and I went down to the basement family room where a bed had been set up for us. We heard them cleaning up the kitchen for a while, but soon we fell asleep. I was disappointed, but John was in his 80’s and Elva not far behind. That perfect pie would remain a dream unfulfilled. We rushed upstairs. Elva was pulling a perfectly round, perfectly brown, perfectly perfect pie from the oven and set it down on the kitchen island in front of John who had seated himself on one of the stools. And not any old pie. But that rarest pie of all – and I don’t mean black raspberry, though that is what it was – I mean the pie of communion, the pie of friendship, the pie of joy, the pie of love. Did it taste as I dreamed it would? Not at all.